In our last quarterly newsletter, we discussed the viability of a low throughput abattoir that has the capacity to slaughter 6 units. This quarter, we discuss the viability of an abattoir with the capacity to slaughter 10 units per day. 10 Unit is equivalent to 10 cattle, 60 sheep/goats or 120 porkers. As mentioned in our previous quarter’s newsletter, the risks that are associated with the illegal/informal slaughtering of livestock are endless and dangerous to consumers and the environment, as no inspection is performed on the carcasses and there is no adherence to the regulations that govern the slaughtering industry. Farmers are also faced with the risk of selling their livestock to the agents at lower prices. As it was witnessed in the previous newsletter, the financial returns of an abattoir that slaughter 2 units per day were not that attractive. Unless poultry is added to the mix, the profit was not that inviting. In today‘s business world, to succeed you either go big or go niche. The Western Cape Department of Agriculture requested the UTA to also test the viability of an abattoir at a bigger scale. The UTA appointed Ivimbi Technologies to carry out a generic viability study to investigate the operation of such an abattoir and the profitability thereof. The report focuses on the production and human resource requirements, capital requirements, infrastructure requirements and financial viability for a rural abattoir with a daily slaughtering capacity of 10 units. It also addresses the possibility of slaughtering different species (cattle, sheep/goats, pigs and broilers) on the same premises. 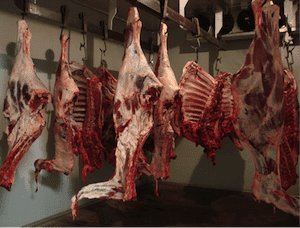 The abattoir business model allows the owner to decide between two methods of operating the business, namely carcass ownership and fee based slaughtering. Both methods have risks associated with them. However, years of experience and training will enable the owner to mitigate the risks, for example that of buying poor quality livestock. The owner must be able to know the quality of the meat he will get from the animals by visual inspection only. Table 1 provides a summary of the financial requirements and the financial projections for the abattoir. The capital requirement for an abattoir with the capacity to slaughter 10 units is estimated at R4 743 000 excluding VAT. Adding a poultry slaughtering facility at the same premises, but not in the same building, will increase the capital cost to R5 793 600.00. As indicated in Table 1, the estimated profit for the fee based slaughtering is R986 354.00 while the carcass ownership method has the potential to generate a profit of R1 776 561. The carcass ownership method requires a lot of operating capital, as livestock needs to be bought in cash. The advantage with this model is that the abattoir can charge premium prices when selling to the end consumer unlike the fee based slaughtering where no sales to the direct consumer is possible. However, the fee based model returns are also attractive given the fact that no stocking risk is carried and no marketing of the meat occurs. A return on equity of R0.21 for fee based slaughtering and R0.37 for carcass ownership for every R1 is achieved. To maximize the profits, the owner can introduce poultry slaughtering, which will increase the capital to R5 793 600 and importantly the profit to R2 247 645 for the carcass ownership scenario. On this scenario, the return of equity will increase to R0.39 for every R1 invested. An environmental impact assessment authorization is a requirement as well as a waste license.